The aim is to raise £50 000 for two Great North East Charities, “The Children’s Foundation and St. Benedict’s Hospice. Mark is no stranger to huge fundraising challenges, having raised £34 000 in Summer 2007 with an 874 mile run from John O Groats to Lands End in 37 days. The Children’s Foundation has always been very dear to Mark’s heart and St. Benedict’s Hospice nursed his mum as she “spent her final days battling cancer and was ensured a dignified end to her life”. Local optometrists Nigel and Judith Robinson from Robinson Optometrists Monkseaton first heard of Mark’s quest as they attended a session of the hugely popular Tynemouth Bootcamp run by fitness coach Dave Fairlamb. The couple were fascinated by the enormity of the task, but being optometrists were keen to quiz Mark about his eye protection. He has a huge potential for UV exposure, especially running through such hostile environments as The Mojave Desert, the driest and hottest of America’s deserts stretching from Southern California to Nevada. Mr. Fairlamb, who also owns and runs a commercial gym on Hawkey’s Lane comments “ I have never ever known anyone mentally as tough as Mark! If he doesn’t break a leg he will make it!” Mark was given a great send off from his final Bootcanp session, all proceeds being donated by Dave to the cause. Above photo Nigel Robinson, Mark Allison and Dave Fairlamb at Mark’s final session of Bootcamp before his adventure begins. Story from Whitley Bay Guardian. 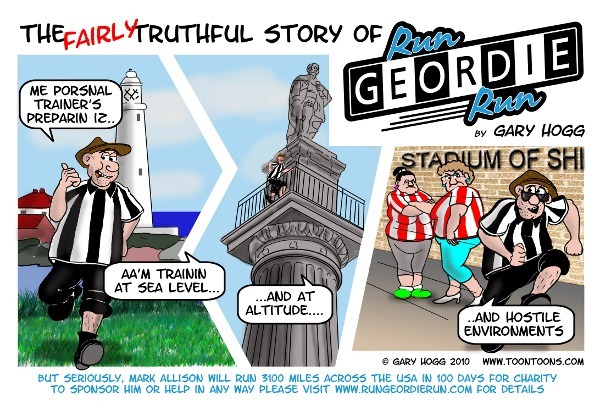 Run Geordie Run image reproduced by kind permission of Gary Hogg.